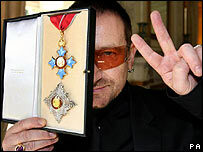 U2 singer Bono has accepted an honorary knighthood at a ceremony in Dublin. Fellow band members The Edge and Adam Clayton joined the frontman's wife and four children at the British ambassador David Reddaway's official residence. The rock star and campaigner, 46, is not entitled to be called "Sir" because he is not a British citizen. He said: "You have permission to call me anything you want except Sir." But he did suggest alternatives: "Lord of lords, your demi-godness," he joked. UK Prime Minister Tony Blair described the star as an inspiration in the fight against global poverty, in a letter that was read out at the small gathering. Bono has become a vocal campaigner about issues of aid and fair trade, particularly in Africa. "I'll leave it to others far more knowledgeable than me to talk about U2's music - all I'll say is that, along with millions of others right across the world, I'm a huge fan," Mr Blair wrote. 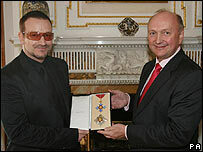 The U2 singer's new title is Knight Commander of the Most Excellent Order of the British Empire (KBE). He said the accolade would help him secure talks about Third World debt with politicians around the world. "An award like this actually really helps me get through a few doors I wouldn't get through and that's the truth, that's the way the world is," he said. He added: "It has been a great year for this award to happen in, and it does feel like this country and Great Britain are closer than they have ever been." He was planning a more low-key ceremony until he saw last week's historic talks between Democratic Unionist Party leader Ian Paisley and Sinn Fein leader Gerry Adams, he said. "I wasn't even going to have a bit of a do, I was going to slip it in, keep it very, very quiet," the star said. "But when I saw Big Ian sitting down there with Gerry Adams I just thought this is the end of an era, but the beginning of a much better one." Other previous non-British recipients of the KBE include Bob Geldof, Bill Gates, Placido Domingo, Rudolf Giuliani and Steven Spielberg.